Now here’s a blog on sugar and skin health and beauty that’s fun and worth reading. It comes from Jacqueline Depaul, the woman behind the Yellow Brick Runway. And quite a woman she is. Jacqueline has a Bachelor of Science in Physics and has served as a consultant to the IT/Telecommunications Industry. At age 38, she became a fashion model, just for the heck of it. She now focuses on fashion for women “of a certain age.” Oh yes, Jacqueline is also a true believer in MEG 21 with Supplamine®. Documentaries abound of the evils effects of sugar on the body. Eating too much sugar alters hormones, increases fat storage, triggers addiction centers in the brain, causes weight gain, obesity, joint inflammation, and feeds cancer and bad microorganisms. And now science has discovered that sugar also CAUSES WRINKLES. So sugar gives me smile lines and causes my neck skin to sag down to my collarbone??? Our bodies use sugars as the nutrient source for energy and for maintaining cellular health. But sugar also combines with the protein building blocks of the body through a chemical reaction called “glycation”, a kind of gluing together of protein molecules, and makes them inflexible. This sugar glycation affects all of the body’s soft tissues, including blood vessels, tendons, and muscle fibers, causing hardening and loss of flexibility. When sugar binds to collagen and other proteins in skin, they harden to form wrinkles and dryness. Think of young skin as strong and supple, full of resilient and flexible collagen to give it that spongy, youthful look, able it to spring back into shape after smiling or frowning. 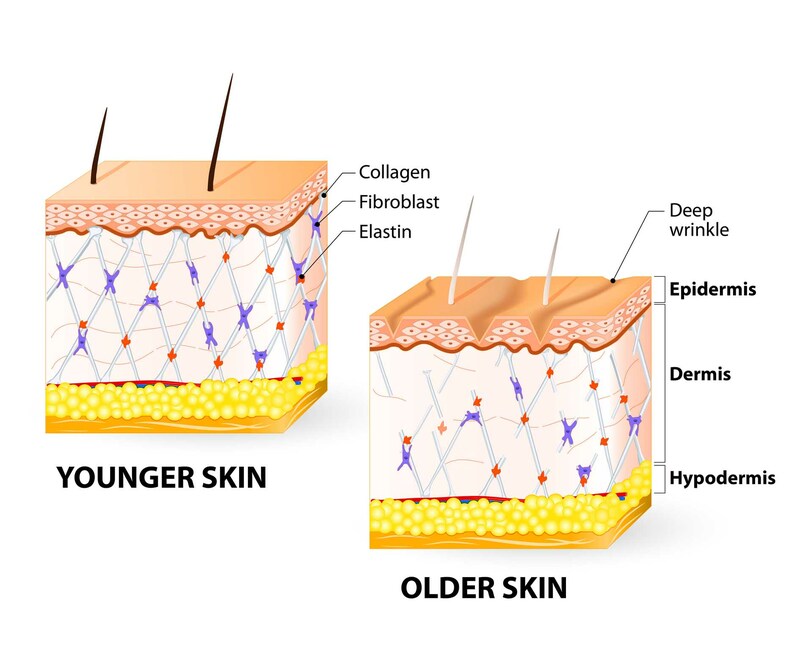 Older skin has damaged, stiffened collagen that has lost it’s strength and flexibility, causing wrinkles to form through facial expressions and the pull of gravity. So that means that every time I get my gluten-free cherry pie fix on, I have chosen to make my skin stiffen into creepy, wrinkled mess. GREAT. First off, time for all of us to get on a low sugar diet. And in the meantime, a very smart scientist Dr. Annette Tobia of Meg 21 Skincare has discovered a way to block sugar from damaging the skin. 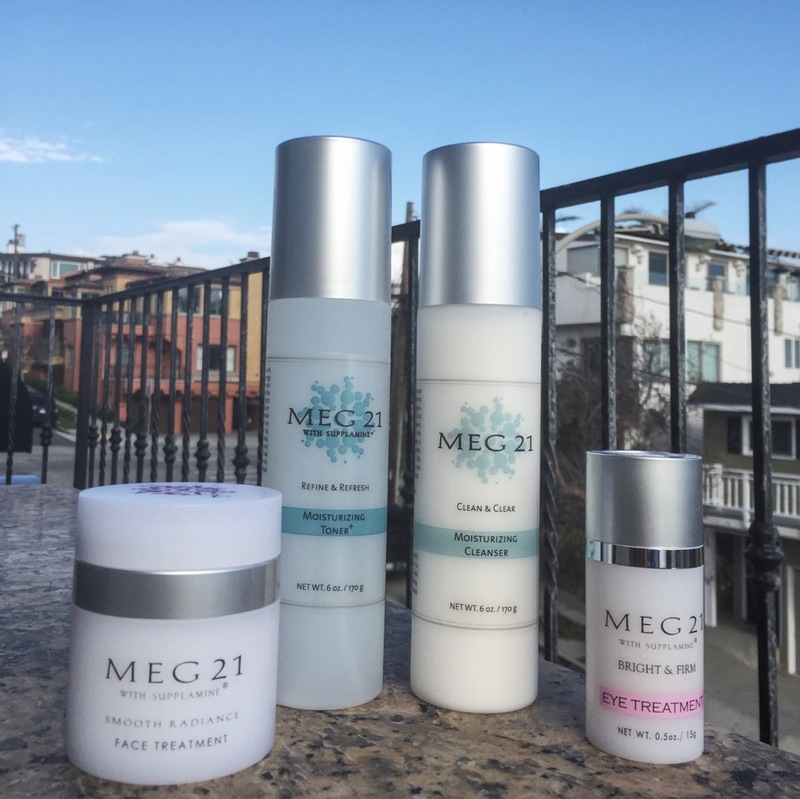 Meg 21 Skincare was founded by Dr. Annette Tobia and a team of scientists from the Fox Chase Cancer Research Center in Philadephia, a leading academic cancer research center. Dr. Tobia is a long-time cancer researcher with a PhD in biochemistry. While their research focused on treating and preventing kidney disease and blindness in diabetic patients, Dr. Annette M. Tobia, Ph.D., realized that, when topically applied, many of these same compounds used to treat diabetics could also be used to treat and prevent visible signs of aging in the skin. This is now a patented ingredient, called Supplamine, that can stop the process of glycation! MEG 21 Skincare with Supplamine® is designed to prevent the glycation process while plumping and firming fine lines and wrinkles, evening the skin tone, reducing redness, brightening dark spots, and improving the texture of the skin. So I can put this on my skin and neutralize the bad guys! Thank goodness. First, THANK YOU Meg 21 for the spectacular packaging! Many face creams come in a pot and I have to stick my fingers into them to get the product out. I am positive I am contaminating them no matter how well I wash my hands. Icky. This packaging is genius- no dirty fingers, skin oil, or bacteria can get into the product. Awesome job ladies! The Clean & Clear Moisturizing Cleanser gets my skin clean without over drying it. I have combination skin. I have tried oily skin cleansers that make my skin scale and red, and moisturizing cleansers that leave my skin feeling like there is a oily coating left on it. This cleanser was fresh and smooth and rinsed away nicely. The Refine and Refresh Moisturizing Toner is even better. My skin alternates between oily, dry, red, and sensitive depending on what’s going on, and somehow the toner calmed all of this down. It exfoliates, moisturizes, and soothes all at the same time. I also like that its alcohol-free and has botanicals with antioxidant properties. My skin looks more clear, balanced and radiant. The Bright & Firm Eye Treatment is phenomenal. It won a 2016 Dermascope Award, and I can understand why because it completely softened and smoothed my under eye area. I can use it under makeup, it is not too creamy for day use, and at night as well. Since my under eye area is getting thin and crinkly I was very pleased with the plumping action of this treatment. And then there is the Smooth Radiance Face Treatment. I only need a small amount to moisturize my face at night. My friends compliment me for my skin looking smooth and dewy and ask what I’m using. I also don’t get the tightness in my neck anymore. All in all I really like these products. I already follow a low sugar diet, but I will take all the help I can get to keep my wrinkles and sagging at bay. Great job @Meg21skincare, I’m impressed.